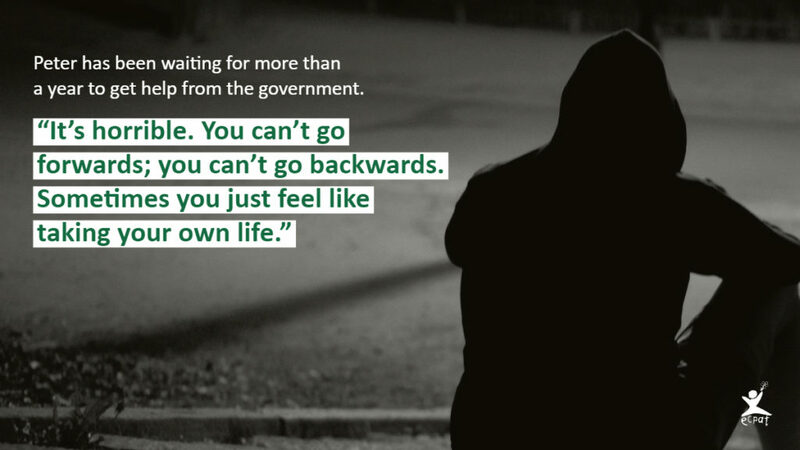 Trafficking victim Peter came in contact with ECPAT UK after he managed to run away from his traffickers, in desperate need of support and a place to stay. In the UK, the National Referral Mechanism is supposed to help victims of trafficking, but cases are piling up and Peter is still waiting to hear from them. “It’s horrible. You can’t go forwards, you can’t go backwards. Sometimes you just feel like taking your own life,” he says. The system designed to identify and support child victims of human trafficking, called the National Referral Mechanism, is supposed to help victims that are rescued in the UK by ensuring that they receive support, a place to stay and if appropriate, asylum. However, ECPAT says that this system is overstretched – and in many cases, victims are falling through the cracks and haven’t been properly looked after by the authorities. Many have been left in limbo – some waiting years for decisions on their status. There are now more than 2,200 victims of trafficking, often for sexual purposes, waiting to hear from the government as to whether or not they will receive support and a place to stay. Including children. Peter grew up in Nigeria and is one of these victims. He came into contact with ECPAT UK after escaping his traffickers. He was desperate for support. However, he says that the National Referral Mechanism, which is supposed to help victims of trafficking like him, is yet to respond with assistance. “It’s horrible. You can’t go forwards; you can’t go backwards. Sometimes you just feel like taking your own life,” he says. Peter’s journey to the UK was a harrowing one. His guardian in Nigeria cooperated with traffickers who came to his home town looking for victims. They promised him a new life with a football contract in the UK. “Basically, that was a dream come true for me,” he says. However, when Peter left Nigeria, the new life he had been dreaming about turned into a nightmare. There was no contract. He says he was held captive and sexually exploited by men every day. When he managed to escape, he was ignored by the police and ended up in the streets, where he later made his way to ECPAT UK – who provided some support. But today, he is still waiting for help from the government. ECPAT UK research shows that since its inception, the National Referral Mechanism has failed child victims of trafficking. It warns that there is evidence of poor decision-making, a worrying lack of child-specific knowledge and child safeguarding, an inappropriate focus on immigration, a lack of training and a lack of a formal recovery and reflection period and specialist support for children. Adding to the delays and the recent findings that trafficked and unaccompanied children are 30 times more likely to go missing than other children their age, ECPAT International supports ECPAT UK’s advocacy to renew the guidelines, recognize child trafficking as child abuse and the provide an individualized and appropriate safeguarding response.